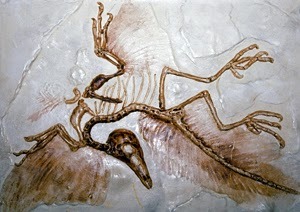 One of the most remarkable examples of a transitional fossil is Archaeopteryx, an animal of the late Jurassic period that exhibited characteristics of both reptiles and birds. Its remains are bone and feather imprints found in slate deposits that are located in Germany. When it lived, more than 150 million years ago, the area was a tropical coastal lagoon. The Earth is always in transition. Except for its prominent flight feathers on its arms Archaeopteryx strongly resembled a two-legged (bipedal) reptile of its time. Its size was similar to that of a crow or robin. It had a strong running ability, with large curved claws that could be used for perching and climbing. Its snout was blunt and its teeth were needle-like points, much like those of modern-day insectivores. The animal had a long, bony tail that was lined with feathers. The skeleton of Archaeopteryx closely matched that of other small reptiles and tiny carnivorous dinosaurs of the period, except for the claw-bearing three long digits of its hands. These were covered in asymmetrical flight feathers. Flightless birds have symmetrical feathers. The asymmetrical flight feathers of modern flying birds provide them with fine control over their wing configuration as well as providing the bird with forward thrust from the feathers on the outer portion of the wing. In addition to having true flight feathers the wings of Archaeopteryx were about the same size as those of comparably sized birds of today. 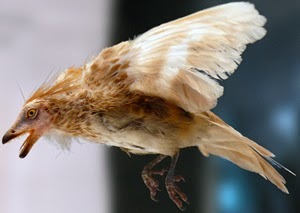 There were also indicators this transitional animal from reptile to bird couldn’t have been a strong flier. The most obvious reason is that it lacked a keel-like sternum, or breast bone, that serves as an anchor for the flight muscles of modern-day birds. 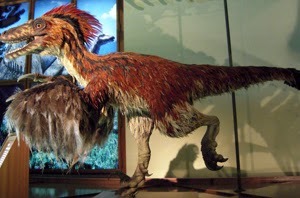 These powerful muscles can represent up to a third of a bird’s weight and they require a large attachment area which is lacking in Archaeopteryx. Instead, this animal’s skeleton remains similar to other bipedal reptiles of its period, lacking a bird’s many fused bones and other refinements focused on flight. 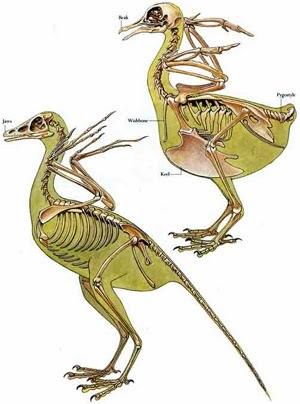 Birds have reduced their pelvic bones into a single, fused structure. Their tail is also reduced and the remaining bones fused into a structure called the pygostyle. 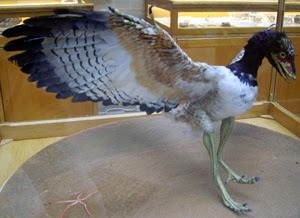 Where Archaeopteryx has three long boney fingers, tipped with claws, birds have a single rigid structure, although the three metatarsals – or finger bones – are evident in the embryonic stage of a bird. Archaeopteryx also has a furcula, or fused clavicles – the ‘wishbone’ – providing attachment for the flight-related pectoralis muscles. There are other anatomical indicators that give strength to the conclusion that Archaeopteryx is a precursor to the arrival of modern-day like birds that appear in the fossil record some twenty million years later in the early Cretaceous period. A number of these birds retained small Archaeopteryx-like teeth in their bills. Up until a few decades ago it was widely believed that ancient reptiles were sluggish, cold-blooded animals. There is evidence available today that make a compelling case for warm-blooded dinosaurs and for some of their closely related reptilian relatives, as well. If this is true then many of these animals would require some form of insulation to retain their body heat. Feathers appear to have evolved from reptilian scales and their ability to trap air would enable an animal to better regulate its body temperature. With time, feathers would differentiate in purpose from warmth-protecting down to the elongated vanes of wing feathers. Archaeopteryx would need a high metabolic rate for flight and that, in turn, would require the elevated temperatures that environment alone might not provide. Whether or not the animal was warm blooded it is likely its body was completely covered with insulating feathers. Flight, the powered movement through atmospheric three-dimensional space, makes demands on an animal’s brain that isn’t required for earthbound four legged animals. 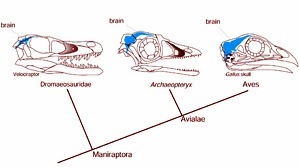 The brain cavity of Archaeopteryx is significantly larger than those of other reptiles similar in size and contemporary to it. The brain-size of modern birds has continued to grow in size as their flight abilities have become stronger and increasingly more controlled. Charles Darwin’s seminal work, published in the book On the Origins of Species in 1859, was quickly linked in its conclusions to the first finding of an Archaeopteryx fossil in 1861. 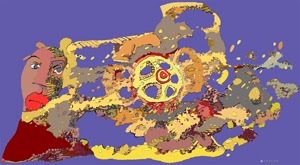 The fossil’s value was soon appreciated by some as an example illustrating the transformations life forms undergo to meet the challenges organisms continually confront with the changing geologic times. I took Jake, the dog, to a large open field a few miles from where I live. I wanted him to be able to run about freely without being stuck on a leash. He almost immediately got the idea and took off. The trouble was he looked to be getting as far from me as he possibly could without any intention of coming back. I began calling after him but he might as well have been stone deaf. I yelled his name, “Jake!” The truth is I don’t think he knows his name. He was left to my care probably about a couple of years ago when he was ten. I’ve never known him to respond to his name. So I yelled “Come!” Actually, he’s not familiar with any commands, either. Finally, I just decided to endlessly yell after him as he set out on his new path in life. Eventually he turned towards me as if wondering what all the commotion was about. He was already a couple of hundred yards ahead and only briefly looked my way before continuing his dog trot for parts unknown. The tables were turned. Without the leash I was no longer top dog of our little pact. It was my turn to follow his lead. I began running after him. Before long he would reach a four lane thoroughfare and he’s never shown much sense regarding cars. True to form he left the vastly interesting environment of the field in order to race up the middle of the street. Fortunately there were very few cars at the time. I was horrified a car might get him before I had the chance to throttle him myself. I probably ran another half mile before he allowed me to catch up with him. Thank God the dog is old. Patience is not among my natural characteristics but I do possess a bit of reasoning. If I punish him on the spot what chance have I to catch him the next time he springs loose? I merely take the leash from my back pocket and snap it to his collar. Once again we’ve become a chained tandem just like always. We finish our walk. He and I have some work to do. I’m not crazy about this sort of relationship. It constrains both of us. Jake wants to snoop about. I want to snoop about. He’s a dog and I’m not. We don’t want to snoop about the same things. Had we been in wide open spaces of desert I would have said “I’ll see you when I see you.” Civilization isn’t healthy for dogs roaming free. Sure a dog can die from a rattlesnake bite but, to me, that’s more acceptable than being mauled by a car. Rattlesnakes are an acceptable risk. Cars aren’t. There’s this Danish philosopher named Kierkegaard. He talks about personal truth. It’s not like the objective truth we associate with math and science. Personal truth doesn’t even have to be true like the equation 2 + 2 = 4 is true. Personal truth is more about what it is we as individuals believe. This is important because what we truly believe determines how it is we act. I may or may not be correct in my belief about something but the action I take based upon this belief does create a truth. Did I or did I not walk away from an accident victim: true or false? The importance of personal truth to me as an individual is whether my actions are sincere. Am I acting true to my beliefs? 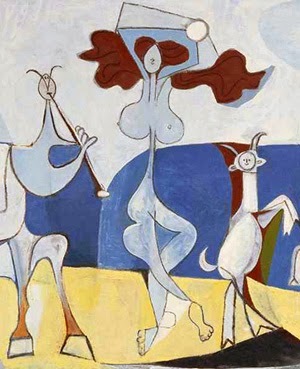 Do I live an authentic life or am I dozing through one meaningful after another? Our education is filled with objective truths – the Earth is round. Few of them have much to do with how we live our lives. On the other hand, personal truths are inescapable facts about us – you and me. They not only govern our actions, they are our actions. We are not our intentions. We are what it is we do. Aren’t we… ? A flurry of goose-down swirls about the full moon before settling amid the grizzled stubble of harvested fields. Trees are drowsy shadows having no care. Rooftops slumber. A small face from around a drawn curtain peers into another winter night. 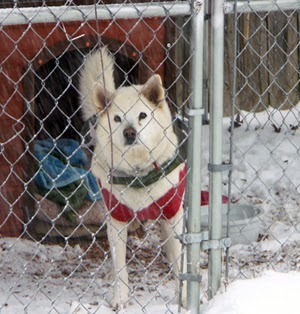 The old dog sleeps, his back to the draft within his tiny home. Nearby a truck groans through its gears as it slows to cross the old iron bridge whose dank lattice-work joints are briefly swept by the light from the truck’s yellowed lamps. Within the cab its driver gulps a last swallow of cold coffee, fighting off the teasing thoughts of warm blankets and a cool, fluffed up pillow for his sleep starved head. He cranks down the window and revives momentarily with the rush of frost-bit air. These backcountry farm roads hold no pity for the weary traveler. Soon the pavement ahead will be lost in a blanket of white. The truck slows. This is country for negligent deer abruptly stepping into one’s only available path. The cab’s window is now tightly sealed. The driver’s neck and upper back begin to ache as muscles grow ever more taught from strain. There’s no chance for sleep now. The mind no longer drifts and has embraced the status of full alert. Let there be light. Let there be a shining sign with the promise of fuel, caffeine and a paved area in which to park and catch a few winks. Let there be a welcoming stranger behind a counter just ahead happy to share a word or two of comfort and humor and revive one’s dreary pulse. Yes, this is a prayer open to bargaining. Let it be answered no later than just around the next darkened bend and certain weaknesses of the flesh will be forsworn for a reasonable period of time. What weaknesses? – you may ask. Now would be a good time to list and savor each temptation in explicit detail as there is no salvation waiting the truck now rounding the road’s gloomy turn. Memory is induced and imagination brings to life pleasurable visions, intimate scent, soft-spoken words and exploring touch. An enveloping shroud hides all that is beyond the reach of one’s headlamps but now the miles peel off with no apparent concern. There is theatre of reignited joys being played out behind the driver’s steady gaze. At some point the mind wanders into the lives of various people the driver has known. What ever happened to the woman whose passenger door fell off its hinges at the drive-in theater? She warned you not to open the door but it didn’t make much impression until you actually grabbed the handle and the whole door crashed to the ground. Then there was the woman who could only talk to you through a hand-puppet. She wore the puppet everywhere. Her garden had clay masks carefully arranged in the soil and they appeared to break the earth so that they would always be looking up into the sky. How do you live among such fragile people while harboring any sense of selfishness? One’s thoughts and moods flow. Time and miles become one and the same. The snow no longer falls. The bend just now turned becomes a long stretch of straightaway. At its far-off end appears a pearl of light that, in time, becomes a tall sign and then a space flooded by overhead lamps and neatly aligned pumps for diesel. There is a sharp gasp from the old truck’s air brakes and then it makes a wide turn to pull up into the fueling station. Opening the cab door you are met with the bone-chilling bluster of a stiff wind. Long johns would have been much appreciated right now. Time to push through that glass door and warm up inside. Time to refill your thermos with the strongest coffee they have. Time to touch base with whatever human being is manning the counter. God knows how long they’ve been without a friendly word. Daylight will soon be here. 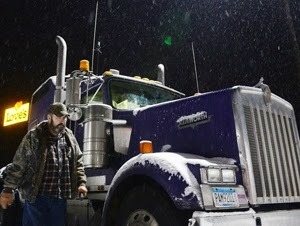 The truck fueled, it’s time to throttle up. The cab gives a jerk and the truck slowly rumbles its way through several gears before settling on a decent cruising speed. There are many miles to go and the need for sleep will return but, for now, all is good – hot coffee in hand and a thin red line appearing on the horizon where the sun will soon emerge. You’re twenty years old today. The years ahead for you will be revolutionary in scope. They will be so different from the days of my time. On the whole I think your future will be much for the better. In any case, you are bound for an adventure. It’s extraordinary how rapidly the human family is changing with time. We have the opportunity to be in touch with, and to be influenced by, far more people than ever before. Smart phones linked to the internet keep us virtually in touch with everyone we’d care to know at most any time. We are constantly being updated with the status of all our friends and acquaintances. This has become a daily routine in many people’s lives. The news of the world is available to us almost the instant it is reported. Nearly every product that isn’t quickly perishable is available to us online, complete with consumer rating and price comparisons, if we care to know. Highly defined images of every variety are presented to us from flat screens large enough to dominate a wall. Combined with inexpensive surround-sound audio systems we have the theater experience within our own home. Viewing a movie requires only accessing a menu to choose from a long list of past and present features that are instantly provided by a commercial database accessed, once again, through the internet. Software that reads handwriting, understands the spoken word and is able to translate one language into another is constantly improving. Interconnected computer systems handle much of our daily lives, whether we are out and about, in our homes or traveling by car. Products iconic to our lives just a few years ago are becoming rapidly obsolete and nearly forgotten. Cameras are going the way of the typewriter. Why have libraries of music on hand when you can precisely program your own musical preferences from a playlist offered by a service somewhere in the clouds? The printed word found on book-bound paper is a cumbersome means of storing information. Why lug around a file cabinet when all its contents are easily stored on a disk that fits in your pocket? Why settle for a phone that merely allows you to talk to another person when it can also be your personal assistant that comes to your aid several times during the course of the day? Want a good lasagna meal out – ask the phone. It tells you what Italian restaurants are in the area, how to get there, what their customers think of them and what you can expect to pay once it’s time to move on to the next item on the agenda. You’re young so most everything here is a familiar part of your daily life. You’ve come to rely on all these features without giving them much of a thought. Older people see these developments as new and dramatic – possibly even confusing and threatening. The fact is this explosion in technological change has just begun for all of us. It’s a fast building snowball on a steep downhill slope. New technologies accelerate research and development into other new technologies and propel their production with new, more efficient means. Once we changed product models year to year. Now we are taking the product’s very concept and refashioning it, comparable to a compressed version of the growth of television. First it was tubes and rooftop antennas then came transistors and cable boxes, followed by the VCR, then DVD, then Blu-Ray, programmable DVRs, 200 channels, Netflix, YouTube and Hulu. That’s good but it isn’t good enough. We’re just warming up – on everything you can think of. The intent is for a future of continuing improved benefits. It would be hard to argue otherwise. But there will also be new challenges for each of us and even possible danger. We are letting a powerful genie out of the bottle, a genie whose potential for mischief is only vaguely appreciated. Who controls the genie? How do we control those who control the genie? Computers have given us the means to open up anyone’s personal life for all to see. They enable criminals to pick our pockets, pilfering our funds like mice in sneakers tiptoeing about the attic. Our own identities can be hijacked without our even knowing until the day comes when we have to plead that all the gang of me running about are all counterfeit. I’m the real me. Honest. Unmanned and undetected drones of ever-increasing ability will not only become more widespread among the globe’s militaries but are also viewed as a natural extension of our own government’s law-enforcement. And it’s not just government that’s interested in keeping tabs on us but commercial businesses, as well. Because so much of what we do requires our own path on the internet, it isn’t difficult for our actions to be tracked, dissected and scrutinized to figure out how we operate and what buttons need to be pushed to get us to do what others want us to do. How will all this affect you? What about our relationships with others? Is there a point when our ability to access always new and varied people becomes something that feels like a consumer searching for a better product? What about that age-old institution of marriage? How does it fit into our highly mobile, restless society in search of opportunity? How long will we adhere to the love, marriage, baby-carriage life-long rule of thumb? Does the image of a family raised under one roof become a nostalgic Hallmark Card theme – replaced by the more complicated dynamics of an extended family of multiple spouses under vastly separate roofs? If that’s what we want, yes. We are no longer shackled by rigid marriage contracts. The human heart is freed. Amen. The increasing role technology plays in our lives provides us with evermore opportunity to improve ourselves, while at the same time, we can become intoxicated with technology-bred new freedoms without ever noticing the risks involved. Let’s celebrate our individual liberty while recognizing that every freedom has a price tag. We always give up something to gain something else. How bad do we want it? There are no free lunches whether its money or matters of the heart. I’m letting a bit of my humbug leak out, aren’t I – and on your birthday. Shameful! Be positive. Favor your natural optimism. You’re young and beautiful. Have a wonderful 20th! More than 2,200 years ago the Greek mathematician Eratosthenes was able to calculate the circumference of the Earth by using geometry, deductive reasoning and some carefully considered assumptions among astronomers of the Hellenistic period. It was the Greek astronomer Aristarchus that presented the earliest known model of the Earth orbiting around the Sun and his ideas would have been known to Eratosthenes and he would build upon this foundation. If the Sun was at the center then there was a philosophical inclination to believe it was also likely to be vastly larger than its orbiting bodies such as the Earth, or its Moon. The Greeks had other, more objective, reasons for this belief and they used this and other evidence in an attempt to determine the distance between the Sun and our Earth. The numbers they arrived at were never close to the actual truth as their means were too rudimentary and the idea of a burning sphere warming a planet from ninety-three million miles away was likely to seem absurd. Eratosthenes believed that whatever the actual distance turned out to be, it would be great enough for the Sun’s rays to strike the Earth parallel to one another. This would be a crucial factor in Eratosthenes’ geometric-based calculation of the Earth’s circumference. 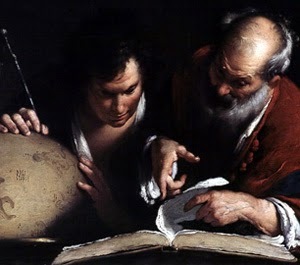 Another belief important to Eratosthenes and other astronomers was the conclusion that the Earth was a sphere. The evidence of this was revealed by the curve of the Earth’s shadow that was cast upon the Moon’s face during a lunar eclipse. There were more subtle forms of evidence supporting this theory, such as a departing ship’s image descending beneath the horizon, but certainly the shape of the Earth’s form projected upon the Moon was the most dramatic. As it happened Eratosthenes was in Egypt and he had become aware that on the first day of summer, at high noon, the Sun was directly overhead in a place named Syene, now Aswan, along the Nile. The Sun’s rays were perpendicular to the land and they shone straight down a deep well, reflecting off the water at its normally darkened depth. 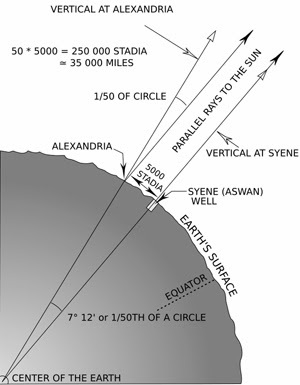 Eratosthenes was also able to determine that at the same time on the same day the Sun’s rays were at an angle of just over seven degrees from the perpendicular in Alexandria, another location in Egypt. He calculated this by measuring the shadow cast at noon in this Mediterranean town. Knowing that a seven plus degree angle represented 1/50th of the circumference of a circle Eratosthenes now needed to know the distance from Syene to Alexandria. His calculation would make that length about 925 kilometers in modern measurement terms. The actual length is closer to 800 kilometers, introducing one of a number of inaccuracies. A related inaccuracy had to do with the precision of the determined angle in Alexandria. The length of the arc representing the distance between the two Egyptian locations should have represented 1/48th the circumference of the Earth and not 1/50th. The circumference of the Earth, according to Eratosthenes, would be 46,250 kilometers or 28,721 miles using contemporary measurement standards. It is thought Eratosthenes used the Greek measurement of stadion, believed to approximate 185 meters. This adds to the uncertainty of Eratosthenes’ final value for the Earth’s size. The Earth’s actual circumference around the equator is a bit over forty thousand kilometers or 24,902 miles. Had Eratosthenes’ calculation given 800 kilometers as the distance between Syene and Alexandria his numbers would come astonishingly close to our current measurement, with only 62 miles separating the two figures. In any case, the human mind demonstrated extraordinary reasoning ability twenty-two hundred years ago, armed only with primitive tools and the most limited of inherited knowledge. Here were individuals attempting to understand their world, not through metaphors and stories, but through objective observation of the world about them and using the tool of mathematics which would improve with time in both power and sophistication. I hope your days are going well. Someday I hope to see the product of your creative mind over the past few years. I am filled with hope. After intellect and love I believe hope is probably the most powerful of human assets. I can’t imagine we would accomplish much if it weren’t for our belief that we can make things always better. A good part of that belief is based on hope. As you know by now there are very few sure things in life. We set goals for ourselves, we start new projects, with the knowledge that these efforts don’t always turn out as we would like. It doesn’t stop us, though. Successful people succeed in their undertakings in spite of their own failures and not due to their enjoying an endless winning streak. Sure, a good deal of their persistence is based on a belief in themselves and a rational evaluation of the fundamentals necessary to achieve their goals but there is always a worthy contribution of hope in the mix. People take on ambitious challenges knowing full well they can’t control everything. There are just too many variables in life that are beyond our ability to influence. Instead of wringing our hands over circumstances beyond our control, we hope for the best. We aren’t all winners to the degree of people we see in the news that hold flamboyant fortunes in money or who have corralled enormous political power or who are celebrated for their great artistic success. These people are but a tiny element of all humanity that also strives to do great things, to make a real difference with their lives. It’s just a fact of life that most of us fall short of attaining our most ambitious dreams. I count myself among these worthy many. Am I crushed? Hardly. I believe I have benefited greatly from my own efforts, as futile as they may seem to some who have watched me over time. I have attempted to be the person I believe that I am. There are many times when I have fallen short of my own standards. There have also been times when I was surprised at what I was able to accomplish through my own energy, faith in people and, of course, hope. Hope is provided us all from birth but it isn’t a magic wand. It doesn't substitute for reasoned judgment, honest effort and the perspective that comes with wisdom. A project based primarily on hope is little more than the purchase of a lottery ticket. Certainly we can do better than fervently pray for divine intervention on our behalf. Blind luck is for those having no other recourse. The great reward in living our life armed with the belief that all of our actions truly matter is that we find ourselves on a path of real personal growth – a life of heightened awareness. We decide for ourselves the actions we take and we take ownership of all of our chosen actions. We are empowered in spirit as we live as actors upon a stage who write their own scripts. We can, at times, be casual with life but we avoid living absent-minded of whom we are. The words I’ve chosen sound burdened with responsibility. Where is the joy? Where is the frivolity of love on a spring day? Can’t we be playful? Heavens, yes. Were I a better writer there would have been more emphasis on the joy that comes with experiencing life more fully. I don’t prescribe a puritanical regimen of work and duty. I only want to pass along my personal thoughts on the importance of being authentic to oneself. I believe my own greatest failings occurred when I attempted to become someone I wasn’t meant to be. Where was my inner compass? I made decisions based originally on guesswork. Then I made decisions to cover for my own previously bad decisions. I fought myself into a corner. I faked a role I couldn’t live. I don’t like the thought but maybe I’m a wolf that tried to live in a manger. That’s a topic for another time. You’re a terrific person, Jacob. Be always who you are. There is no greater reward for you.